There are restaurants you stop at to fill your belly, and then there are restaurants you visit to fill the pages in your family’s book of memories. 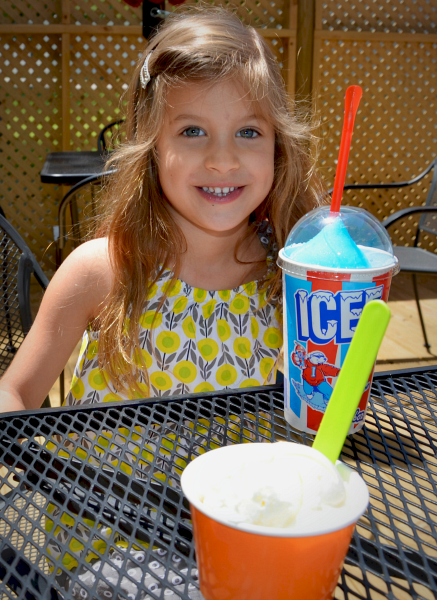 All Aboard Ice Cream is one of those memory-making restaurant destinations. All Aboard Ice Cream is located on Highway 86, just south of Joplin. It’s right across the street from Shoal Creek and some of Wildcat Park’s scenic hiking trails. Take advantage of this great location by enjoying a nature walk before or after your visit to All Aboard. 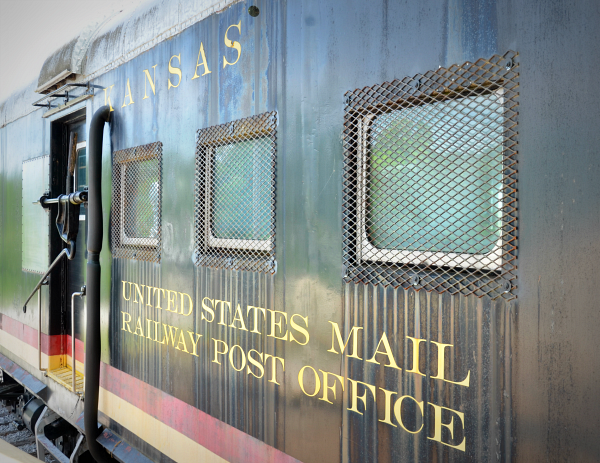 The Kansas City Southern postal car that sits in the front of the property attracts curious visitors to All Aboard, but the old-fashioned ice cream and hamburgers are the gustatory draws (more about those later). When my daughter and I visited All Aboard, the first thing she did was run to the rail car to begin exploring. 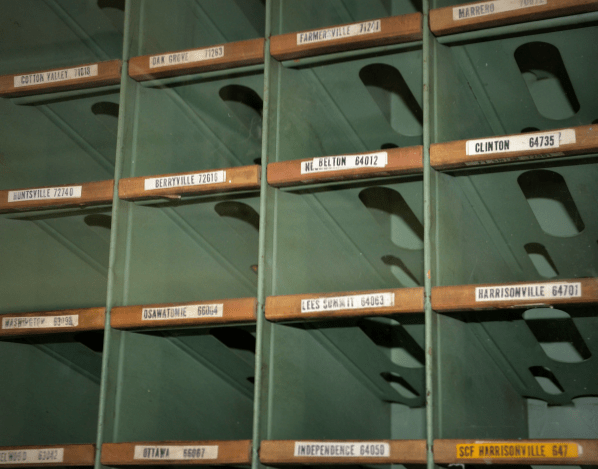 This was once a postal car, and I found it interesting looking at the names of the towns listed on the mail slots in the center of the car. Back in the day, it might take days or weeks for messages to be delivered. Explaining this process to email-savvy young ones makes for a unique history lesson. 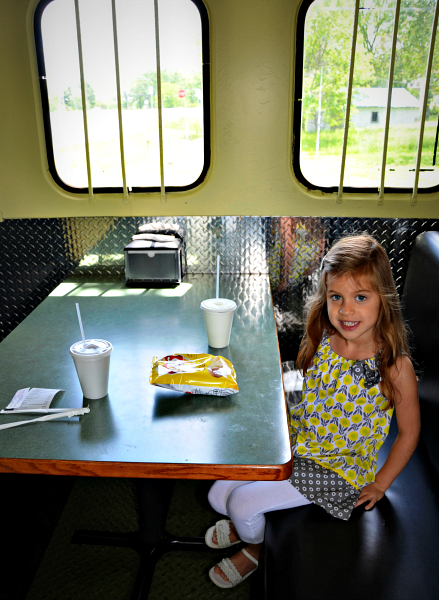 You can also eat inside the air-conditioned rail car at one of the dining booths. By the way, All Aboard offers birthday party packages in the rail car. Talk about a one-of-a-kind location! After exploring the rail car, we headed over to the train depot to order our food. 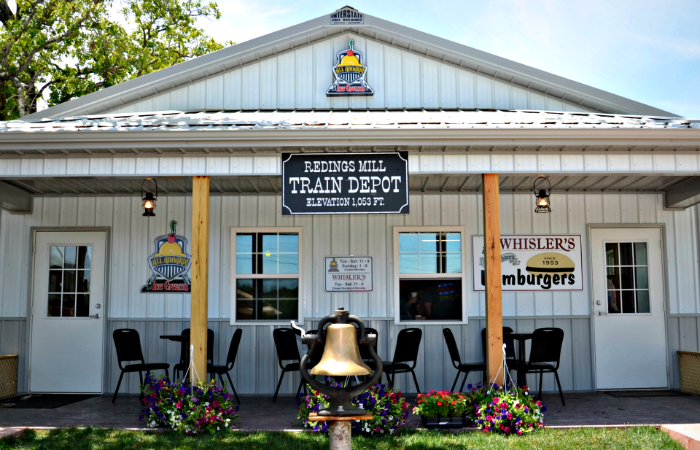 The counter is divided between All Aboard’s dessert orders on the left and Whisler’s Old-Fashioned Hamburgers on the right. Burgers? Wasn’t this supposed to be about ice cream? I promise I’ll get to the ice cream, but first let me tell you about Whisler’s. Lunch before dessert, you know. 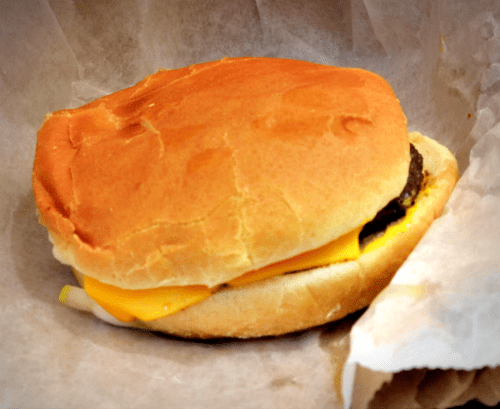 People who grew up in southwest Missouri have heard of the original Whisler’s in Carthage that has been perfecting its hamburgers since the 1950s. Well, I didn’t grow up around here so I’d never heard about Whisler’s until it opened at the All Aboard location. Whisler’s is the type of all-American restaurant that you envision when you think of the wholesome 1950s, when burgers and ice cream were regarded with much more reverence than those served in today’s fast-food chain restaurants. That’s because everything was made from scratch back then – and with quality ingredients. 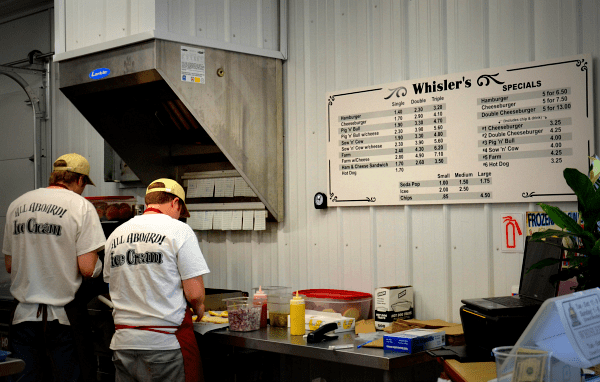 Whisler’s old-time burgers are made to order on a busy, sizzling grill in the open kitchen. If you come at peak lunch time, be patient. There’s only so much room on the grill, so strike up a conversation with your neighbor in line while you wait for your juicy beauties to be ready. I ordered a single cheeseburger, which is slightly larger than a slider. Made with fresh, local beef, this burger was dressed with mustard, onions, pickles, and cheese, and topped off with a fluffy bun. If you’re craving more meat, you can order double and triple burgers, or you can choose burgers topped with other types of meat, such as the “Pig and Bull” (with ham), “Sow and Cow” (with bacon), and the “Farm” (with ham and bacon). My daughter doesn’t like burgers (what?! ), so she ordered a hot dog. She was obviously happy with her choice. A good old-fashioned slider meal begs to be topped off with a rich, creamy treat. All Aboard makes it easy to satisfy that craving by presenting a variety of ice cream flavors at the counter adjacent to Whisler’s. I confess that I’ve eaten All Aboard Ice Cream countless times in the past — but it was known as Anderson’s Ice Cream back then. Anderson’s Ice Cream satisfied the collective sweet tooth of the Joplin community for many years. Carl and Freda Anderson founded the original ice cream company in 1936 in downtown Joplin, and it was operated by family members until 1999. In 2012, Billy Garrigan answered the prayers of many Joplinites and opened up Anderson’s Ice Cream inside the Candy House Gourmet Chocolates‘ building. Treating my kids to Anderson’s Ice Cream to kick off the first day of summer vacation became our family tradition. When Garrigan moved his business in 2015, he also changed its name to All Aboard because a company in the Northeast had trademarked the name Anderson’s. While it would’ve been nice to carry on the Anderson’s name, I think All Aboard suits this train-themed business perfectly. Drew Evans is the owner of All Aboard now, making premium ice cream in the Anderson’s tradition (its richness comes from 14% butterfat). I tried a scoop of caramelly Creme Brûlée (which is hard to see in the photo because it was such an incredibly bright day), and it was creamy perfection. When Garrigan opened All Aboard, his goal was to make the business and location as family friendly as possible. He scored well with the high-quality (yet affordable) burgers and ice cream. The train theme puts him over the top. 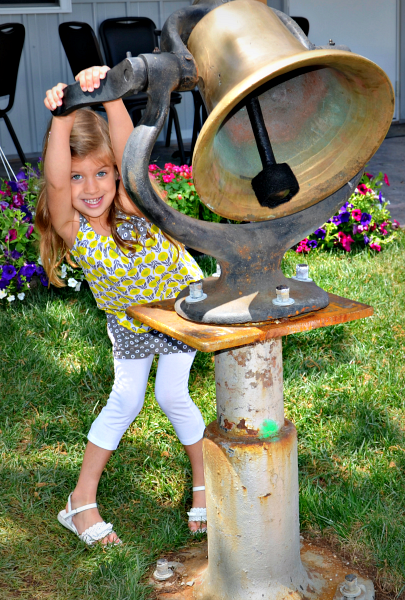 …and ringing the bell in front of the train depot. Older kids can play in the picnic area out front, and young children can toddle around safely in the enclosed patio area where their parents can sit down and eat in peace. There’s also a sandbox and a mini train; tickets can be purchased for a ride around the picnic area. 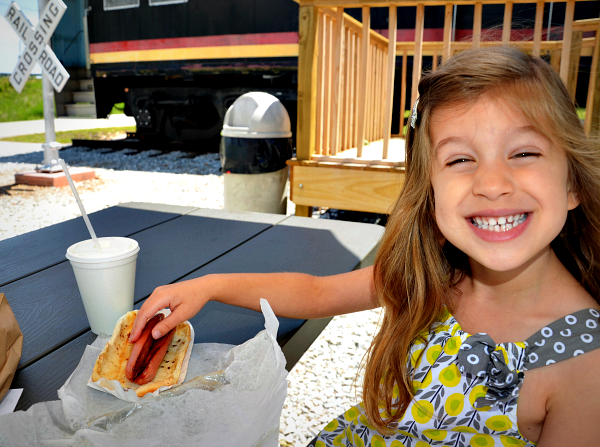 All Aboard has gone to great lengths to create a destination where families can enjoy wholesome food and family fun. And where lasting memories are made. All Aboard is located at 102 Castle Drive. Visit its Facebook page here.